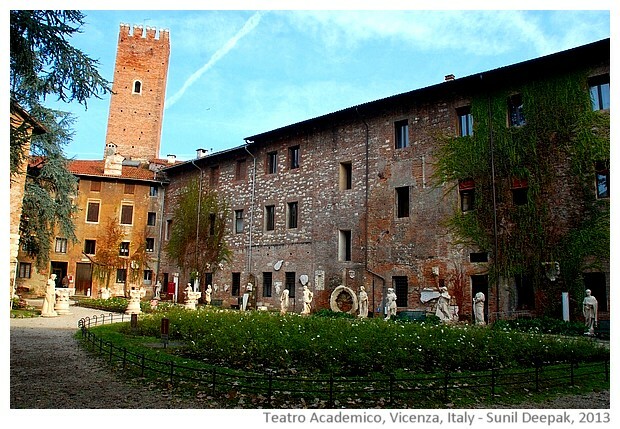 Vicenza is a small and beautiful city. Its name is linked to Andrea Palladio, one of the most influential medieval architects whose works and ideas continue to inspire architects even today. This post is about a walking tour of Vicenza and an introduction to some of the works of Andrea Palladio. 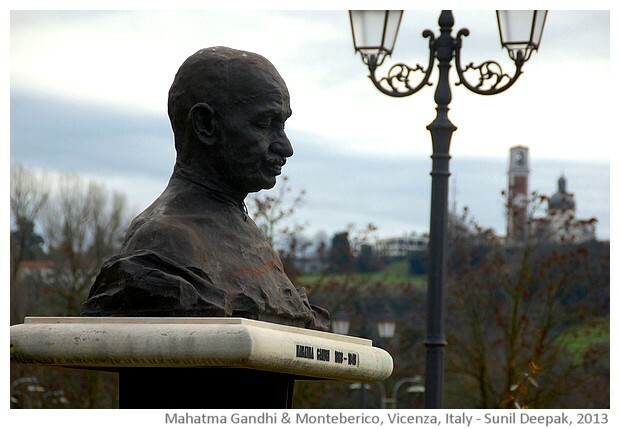 The image above is from the Marine monument near the railway station of Vicenza. 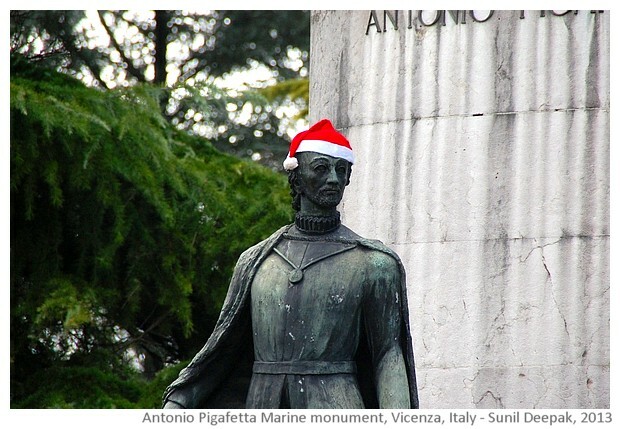 Some one had put a christmas cap on the head of Antonio Pigafetta's statue, one of the mariners on the Portuguese ship that went around the world in 1521-22 AD. 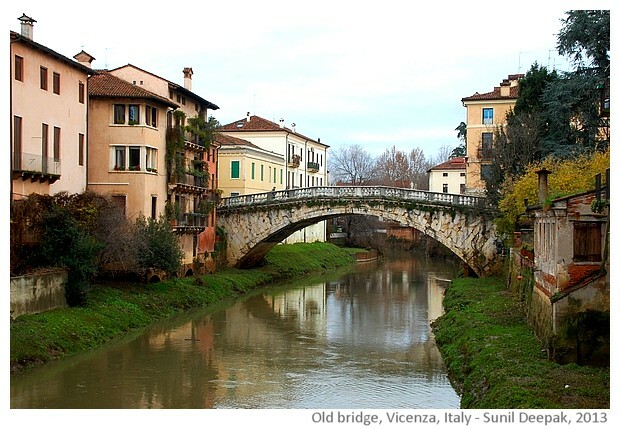 Vicenza is on the railway line connecting Venice to Verona and Milan. 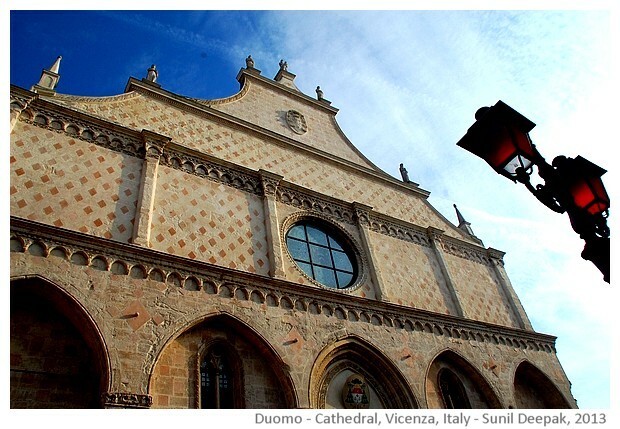 Usually people visit Venice and then go to Verona for its connection to the Romeo-Juliet story. However, if you have a little time, I recommend that you visit Vicenza and Padova (Padua) on the way - both cities are worth a visit. 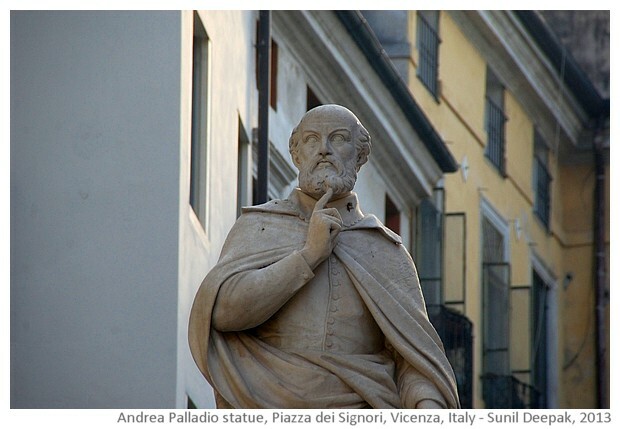 Andrea Palladio was born as Andrea di Pietro in Padua in 1508 and his father had a flour mill. When he was 13 years old he came to Vicenza to work as a stone cutter and then as a mason. From this lowly job he rose up to become one of the most admired architects of his time and wrote 4 important books to explain his principles and ideas about architecture. The statue of Andrea Palladio shown below is from the main city square called Piazza della Signoria (Square of the Lords) in Vicenza. After his death, Palladio's name slowly became famous in the English speaking world where his follower architects called themselves as Palladians. A few years ago, on the occasion of a Palladian exhibition in UK, Jonathan Glancy had written an article about Palladio in The Guardian - The stonecutter who shook the world. Palladio brought back the Roman style of architecture (based on the classical Greek), focusing on symmetery, essential clean lines and grace, avoiding heavy embellishments. 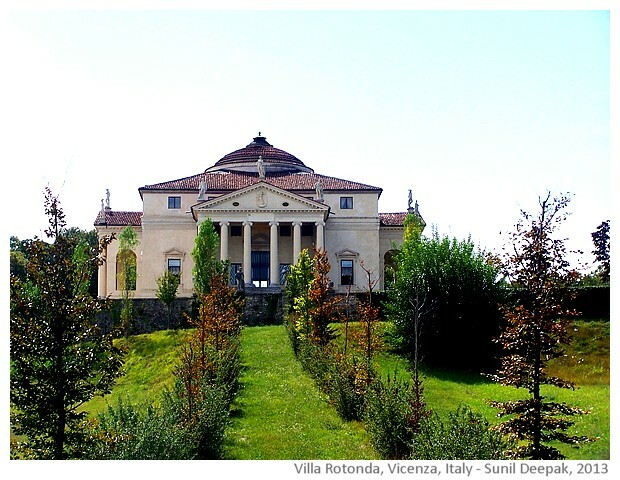 Villa Rotunda, one of Palladio's creations just outside Vicenza (shown in the image below) is one of his more famous buildings. It has inspired a number of important buildings around the world including the White House in USA. The main city square of Vicenza, Piazza dei Signori, is rectangular with a green domed Basilica (Court house) built by Palladio on one side (shown in the image below). In this building you can see the style of windows that became famous as Palladian windows, with a central arched opening in the middle, and narrower, flat roofed openings on the two sides. 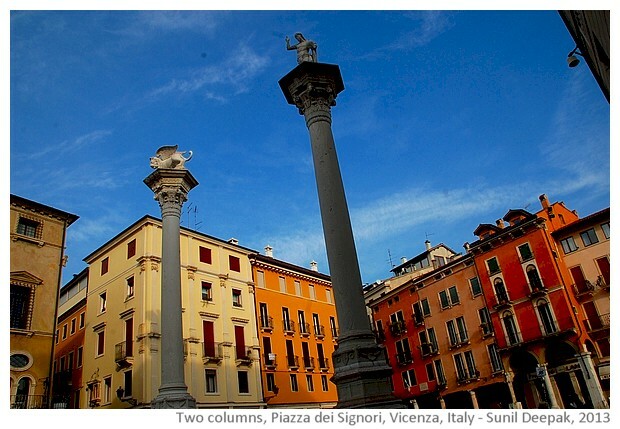 At one end of the square, two towers carry the symbols of the Venetian republic, of which Vicenza was an important part in the medieval period. 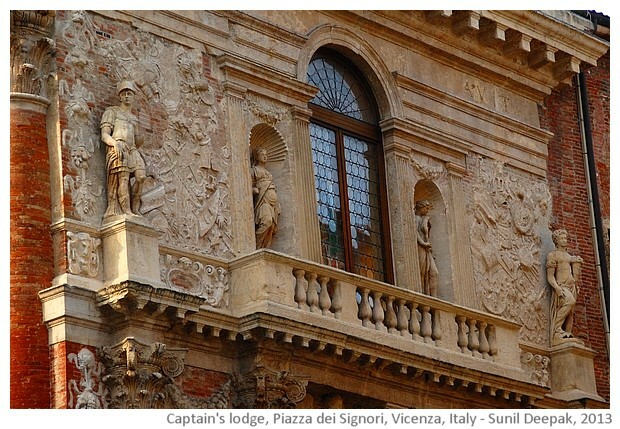 On the other end of the square, opposite the Basilica is another of Palladio's creations - the lodge of Capitanio, that now hosts the municiple assembly. 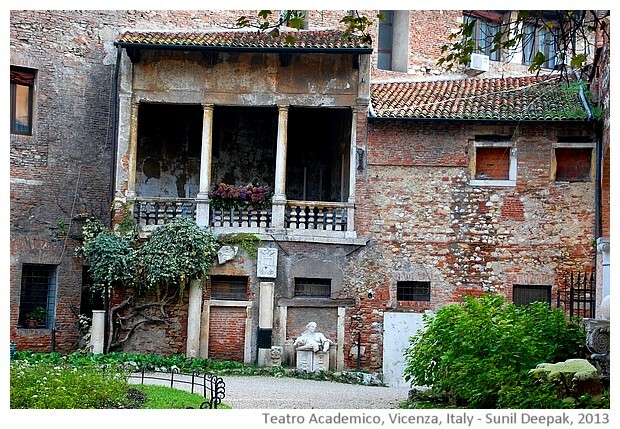 A short distance away from the Basilica, is the Academic Theatre (Teatro Academico), another of Palladio's creations. City has many other buildings by Palladio including a Palladio museum. 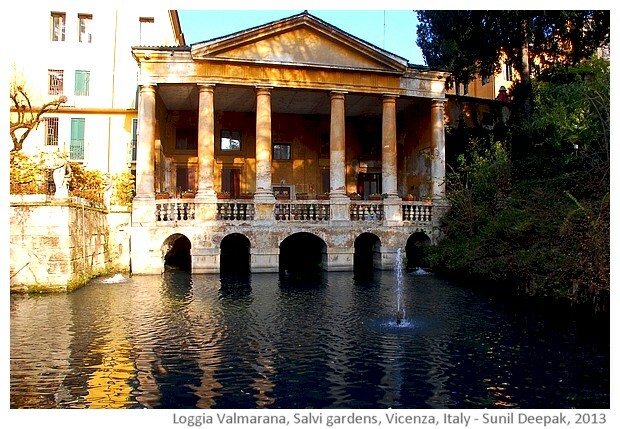 Some other buildings, such as the Valmarana lodge (in the image below) in the beautiful Salvi gardens, carry unmistakable signs of Palladio's influence. 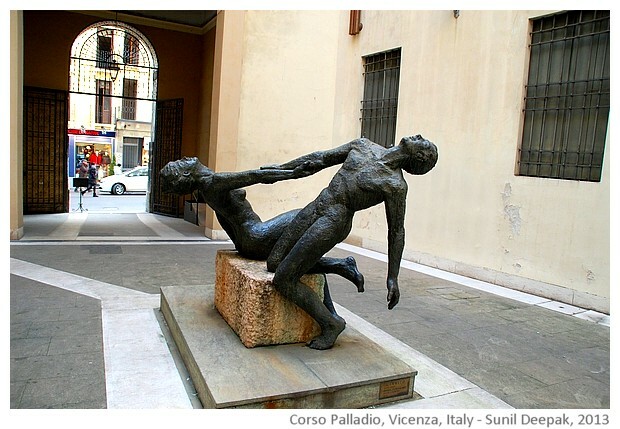 To honour Palladio, the central street of the old part of Vicenza is called Corso Palladio. 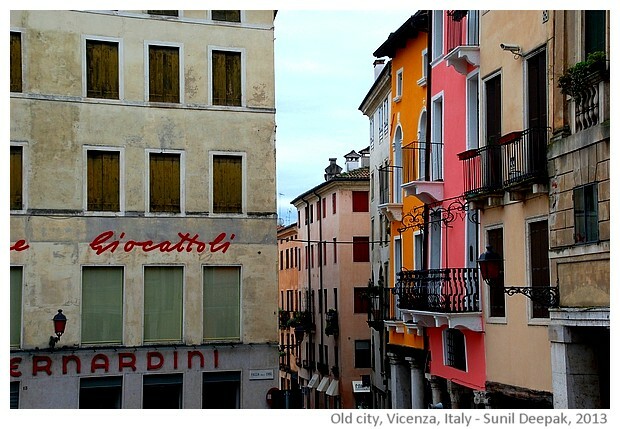 Flanked by beautiful shops, medieval buildings and sculptures, it is the street where Vicentini (people of Vicenza) come out for their walk on the weekends. 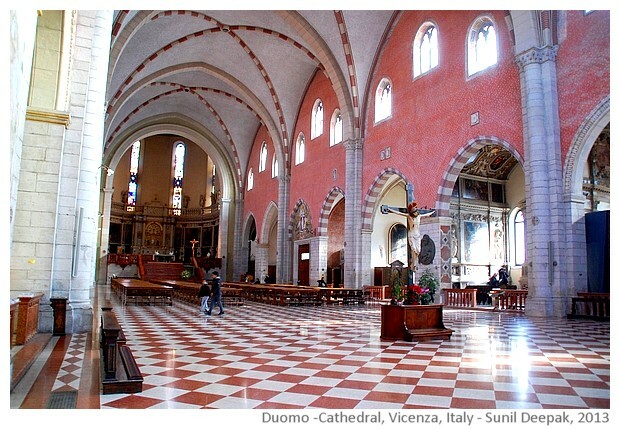 The pink coloured medieval cathedral of Vicenza (il Duomo) is worth a visit. Its dome was also designed by Palladio. 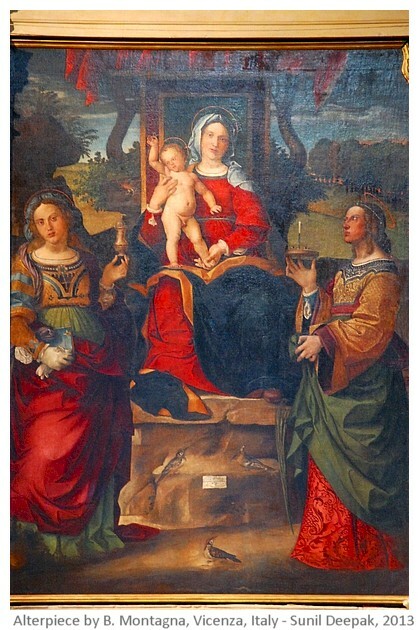 The cathedral has a number of beautiful paintings such as the one shown below (by Bartolomeo Montagna from early sixteenth century). 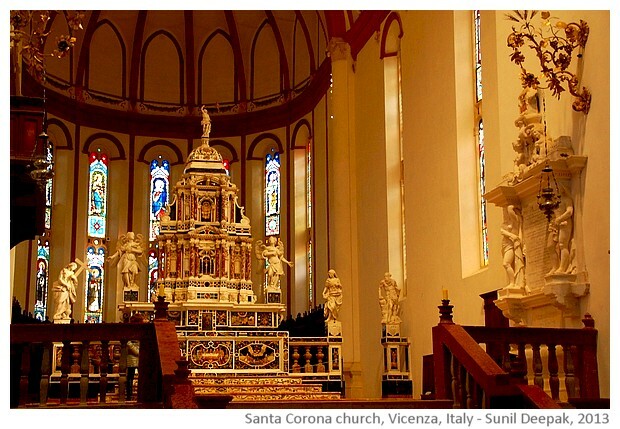 Another important church of Vicenza, just off Corso Palladio, is Santa Corona (Holy crown). Palladio is buried here and he had also designed parts of this church. 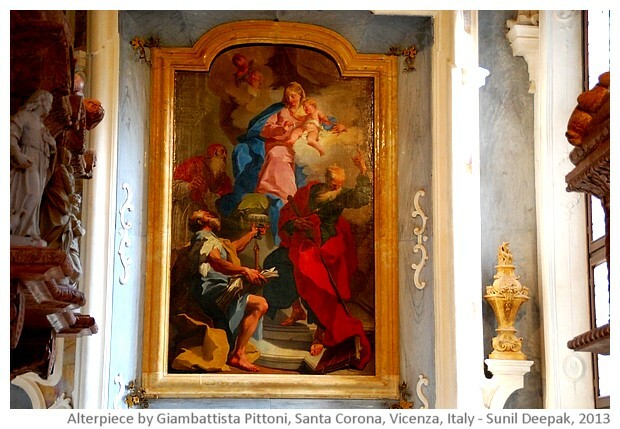 Santa Corona church is full of wonderful paintings like the one shown below (by Gianbattista Pittoni). 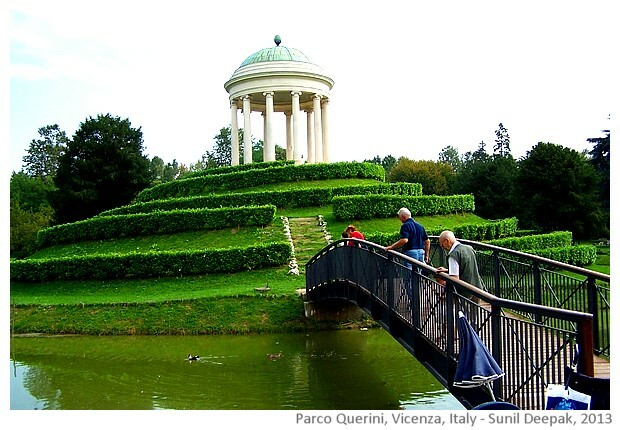 Another nice place to visit in Vicenza is the wonderful Querini gardens with a canal, water birds and medieval statues. San Michele bridge, also called the old bridge, from sixteenth century is closed to the traffic and is a romantic looking place. Around San Michele bridge and just behind the Basilica is the oldest part of the city. 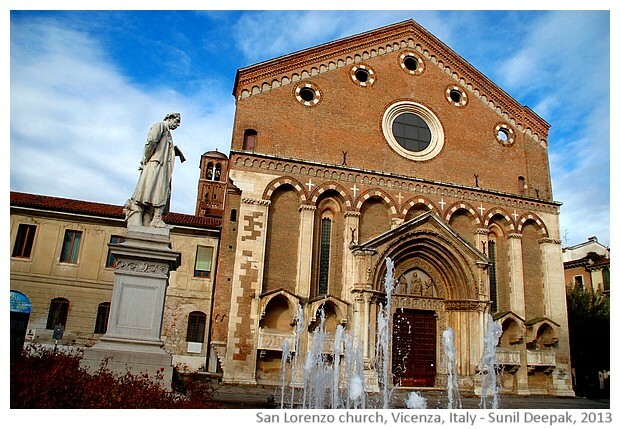 San Lorenzo church from 13th century is one of the older churches of Vicenza. 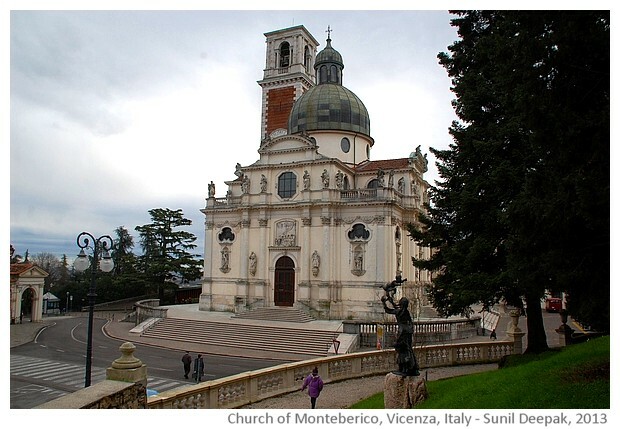 Close to the city, behind the railway station is a small hill called Monte Berico that has the Monte Berico church, built at a place where a peasant had seen the Madonna in 15th century. 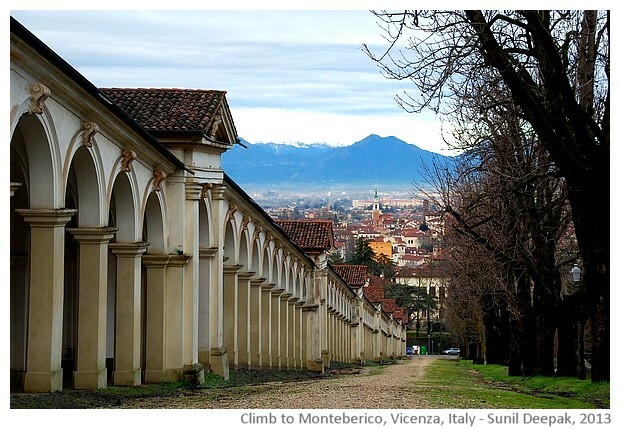 Going up the hill along a passage covered with archways, is a wonderful way to look at the snow-covered Alps mountains surrounding Vicenza and for the beautiful panoramas of the city, as shown in the images below. 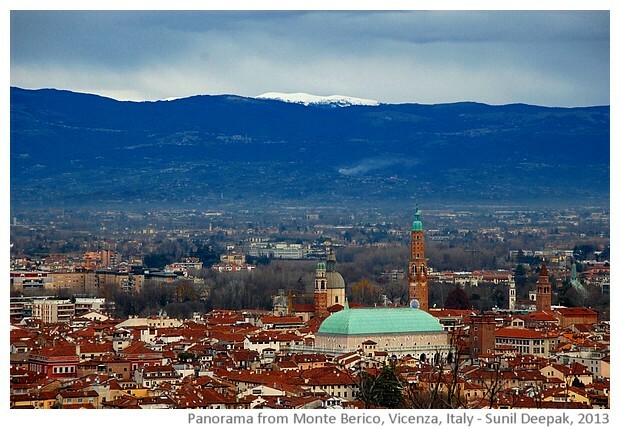 In the panoramic view of Vicenza seen in the image below, you can easily see the green dome shaped roof of Palladio's Basilica. Parts of Vicenza shown in these pictures are all situated in a relatively small area and are easy to visit on a walking tour, starting from the railway station. 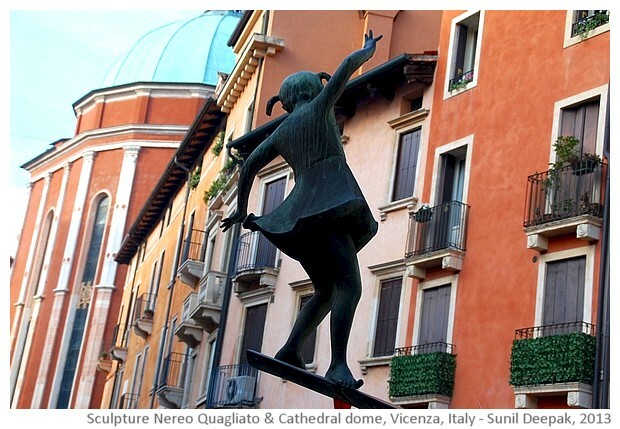 The last image of this walking tour has a wonderful sculpture by a Vicentini artist called Nereo Quagliato and in it, you can also see the dome of the Cathedral,designed by Andrea Palladio. 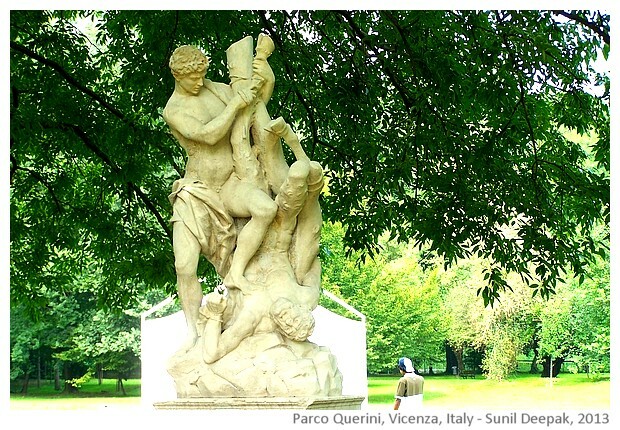 When you visit Vicenza, works of Palladio accompany you every where. If you have time you can even join tours that take you to the different villas designed by Palladio in the surrounding small towns and countrysides. I have been told that it is a wonderful tour with wonderful views of vineyards. Wonderful post and beautiful pictures! I have never visited Europe. Hope to visit Italy sometime soon. 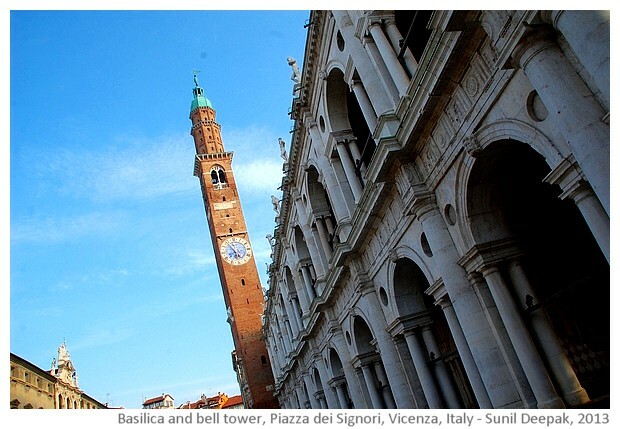 Congratulations and thanks for this interesting page about Vicenza.....i've benn in many italian citties and i think than Vicenza is my favorite.....What incredible architecture!!. Well, Meera, my best wishes from Barcelona.